This entry was posted on June 13, 2012 at 11:34 pm and is filed under Drama with tags 1983. You can follow any responses to this entry through the RSS 2.0 feed. You can leave a response, or trackback from your own site. This is one of those films that i keep meaning to get around to, but others that get added to my TO WATCH list keep bumping it down. Its worth checking out for the visuals at least Scott but as long as you keep in mind that it was written by a teenager for teenagers then you can’t go far wrong. Coppola’s approach to it is very impressive. I remember this was my favorite movie ever once upon a time. Now I don’t remember that much of it apart from the handsome Rourke with the melancholic smile and the fishes, the only color spot in the entire film. It was pretty, wasn’t it? I’m almost afraid to revisit it, unsure of if it will keep up. But it sounds as if I could thread that path again without fear. I think The Outsiders was probably my favourite once upon a time but this is definitely a stronger film. There is still a jarring sense of adolescence about it but I think thats down to Hinton’s writing. Coppola doesn’t quite manage to transcend that but visually it’s still outstanding. I don’t know if you know this, but amongst the crew, the film was known as “Mumble Fish” due to Rourke almost indecipherable dialogue. Lol. I still think his performance is great though. You can’t beat a bit of the Rourkster. Very interesting choice for a double billing here, Mark. I’ve actually never seen this one but it sounds pretty super. It’s in a similar vein as The Outsiders Andy but done in such a gorgeous monochrome way. The material is still the same and aimed at a younger audience but Coppola does try to mix things up cinematically and it works a treat. If you go into with the right frame of mind, you should enjoy it. Nice reviews, Mark. All of the films based on S.E. Hinton’s work (and numerous knockoffs) are all kind of blurred together in my childhood memory, so I’ve been meaning to get back to them at some point. 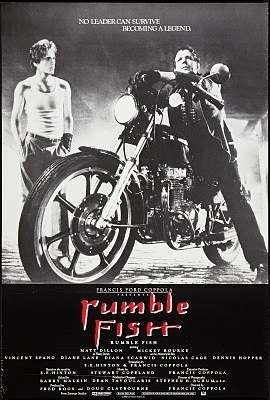 Nice to hear that Rumble Fish holds up pretty well, as I’m not sure I ever actually saw that one. Cheers Morgan. Yeah, they are a couple of film’s that seem to be a big blast from the past for a lot of people. 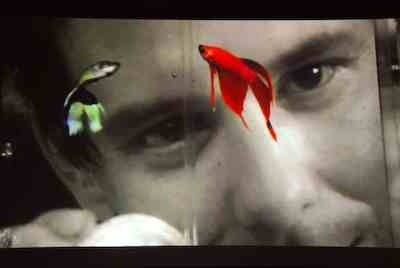 You should have a look at Rumble Fish, it’s a decent film. Great review. Sounds very interesting. The plot reminded me a little of American History X. The cast is certainly impressive as well. It’s far from American History X Fernando. I loved that film but this is aimed at a younger audience and done in such a dreamlike style. Worth checking out, if only to see Coppola change his style. I just meant that the whole brothers storyline reminded me a little of AHX but I can see where they’re different from each other.